On May Day this year, Year 4 sold items to the rest of the school (read about it on this blog post). Today with all the profit we made from our selling, we had a fun day out along with 4.1 and 4.2. We went to our local park and then visited Blakesley Hall where Wisey, our school owl for The Big Hoot is displayed. Our day started off with Mr Garcia's balancing skills! 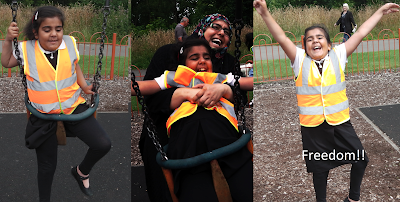 There were many highlights to the day, not to mention the time Zunaira got stuck in the toddler swing! And when Emmanouil was banished to park prison! Everyone loved the spring seat! Tom is looking as cool as a cucumber! With her new found freedom, Zunaira headed towards more fun games! After playing, we then left to visit Blakesley..
We loved this Tudor tapestry in the reception, it reminded us of our Tudor banquet. ...before heading back to Queen's for Fish and Chips. What a treat! Followed by an extra treat. Thanks for the surprise Mrs Porter! What a perfect way to end the school year, we hope we have another trip like this next year! Wow what a fun filled, creative, energetic, brain enlarging year you have all had in 4.3! I hope you will join me in wishing Miss ( Happy Blogger ) Khan all the very best, and a MASSIVE " THANK YOU" for sooooooo many areas of school she has supported, especially in 4.3. Thank you Miss Madden. It has been a fantastic year and we have all enjoyed coming into school every day. Especially the amazing, talented, kind, generous, awesome etc etc Miss Khan (^.^) Thank you for all the support throughout the year <3 "Together we are achieving".